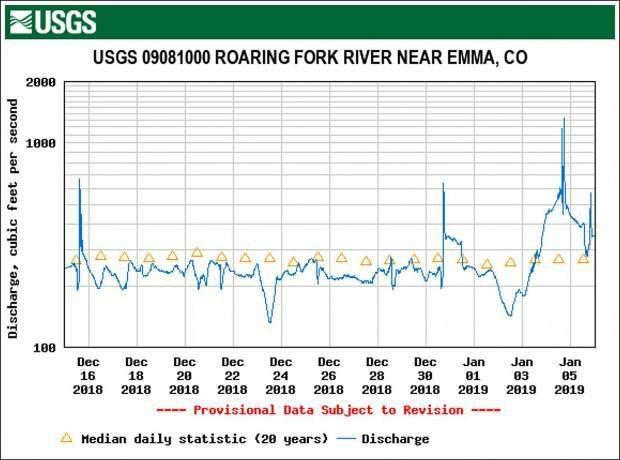 This hydrograph for the Roaring Fork River at Emma shows water discharge between Dec. 15 and Jan. 5. The spikes represent events where ice jams broke, sending surges of water downstream. There were two on Dec. 15, one on Dec. 30, two on Jan. 4 and one on Jan. 5. Is it ice flow or ice floe? Turns out, it’s neither. It’s simply the buildup and breaking of ice jams. 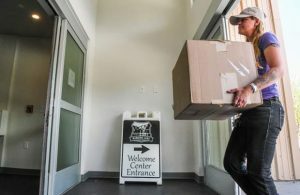 The two surges of water, ice, tree trunks and debris on Jan. 4 spurred a debate on the websites of Roaring Fork Conservancy and The Aspen Times over proper usage of flow or floe. The conservancy reported the events as ice flows. 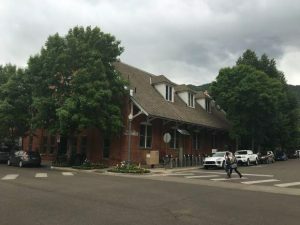 An Aspen Times reporter’s story initially said flow, but copy editors changed it to floe. Christina Medved, director of public outreach for the conservancy, took the initiative to figure it out by contacting the National Snow and Ice Data Center. They replied that ice flows and ice floes, while different, both relate to sea ice and glacier flow. Instead, the rivers simply experience the breakup of an ice jam. Every river has a story to tell, Roaring Fork Conservancy staffers are fond of saying, and part of that story is documented in hydrographs. The hydrograph for the Roaring Fork River at a gauging station in Emma shows there were six breaks of ice jams between Dec. 15 and Saturday. The two that captured the most attention occurred Jan. 4 — sending surges of water, ice blocks, logs and debris through the midvalley. A video of one event posted on the Basalt-based conservancy’s website has been viewed nearly 130,000 times. 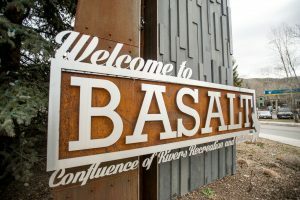 A Basalt resident reported to conservancy staff this week that he was walking his dog Saturday evening when he noticed the river was making more noise than usual. 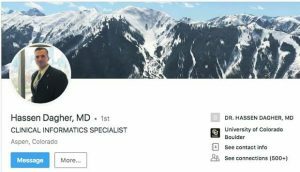 So they checked the hydrograph and, sure enough, another smaller ice jam break appeared to have occurred that evening, according to Christina Medved, the conservancy’s director of public outreach. That spurred the staff of the nonprofit organization to dig deeper into the forensic evidence via the hydrograph. The hydrograph data showed the water flow dipped with the temperatures in mid-December as the river iced up and then spiked after warm temperatures and pressure broke up the ice jam. The water flow at Emma fell from 250 cubic feet per second to 200 cfs and suddenly surged to 700 cfs in a matter of hours. There ended up being two breaks of ice jams that day, according to the stream flow evidence. On Dec. 30, the scenario was repeated, with the flow climbing to 700 cfs from a low of 200. 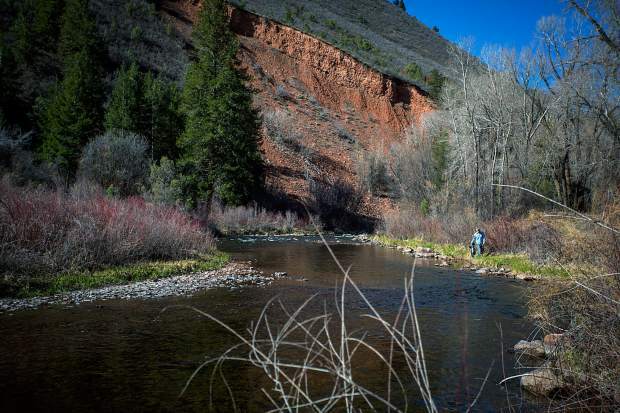 Those first three events went largely unnoticed, but shortly after the new year, conservancy staff knew something was in the works when the water flow fell to 150 cfs. They issued a notice at noon Jan. 4 that warming temperatures after a cold spell could lead to ice jams breaking. About two hours after the warning, the first of two massive breaks occurred, with the water flow reaching about 1,200 cfs. A second, even larger event followed at 4 p.m. with peak flow at about 1,350 cfs. In some places, huge pieces of ice were found more than 10 feet up the stream bank, Medved said. No flooding or injuries were reported. Pitkin and Eagle counties both issued alerts about the Jan. 4 events. The big concern is that surges will catch unaware anglers. Rick Lofaro, executive director of the conservancy, said he heard at a local fly-fishing shop this week that two anglers reported they received an alert while in the river at Hooks Bridge. They exited before the high water reached them. The latest ice jam break Saturday night produced a mini-surge of about 600 cfs. Medved said it is impossible to determine if there will be more ice jams building up and breaking. It all depends on weather. With the exception of the latest event, all appeared to happen on warm afternoons, she said. “We just want people to be careful,” she said. It’s unknown if five ice jam breaks in three weeks is unusual or any type of record. Lofaro said the conservancy might do some digging in hydrograph records to investigate.